Mary with one of her students at the Rogue Distance Festival 10k. Photo courtesy of AzulOx Photography. Mary Renfro was a volunteer coach with Marathon High for the 2014-2015 season. She coached our largest program at KIPP Austin Academy of Arts and Letters. Originally, I was unfamiliar with Marathon High. I work with AmeriCorps: A Community for Education, and I was on the search for a community partnership that supported physical activity. One of my colleagues, Kat, posted a comment about Marathon High on our ACE Facebook page. She talked about an opportunity to coach junior high or high school students in running a half or full marathon. I was super excited to see this opportunity and was interested in learning more about it. I grew up participating in a variety of sports, but track and field was always one of my favorites. For this opportunity to present itself was definitely a blessing, especially at the time it was presented. I wanted to be a part of Marathon High because it stands for the things that I firmly believe in and am passionate about. 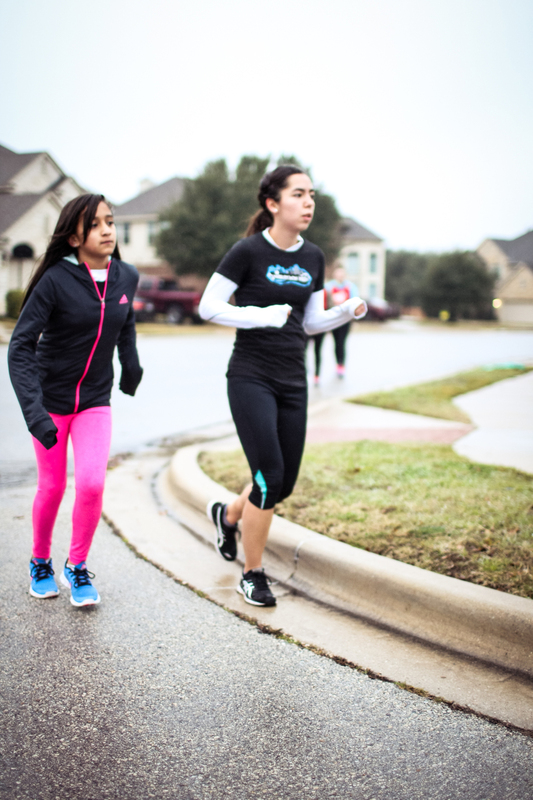 It emphasizes a healthy lifestyle through running which students can continue to participate in throughout their lives. It also provides students with an opportunity to push their selves to reach their goals. For me being there, motivating the students, and helping them was just a part of what you do to be a good coach, which is what I strove to be. It was nice to hear that as a group we were making a difference in their lives. As coaches, we were able to see how far our students have come and how hard they have worked. Marathon High provided me with the opportunity to lead by example, and I definitely tried my best. I would love to thank the students for the things that they have taught me because that has helped me grow as a person. One change that I saw in my students was that they started to enjoy themselves at every practice. At first they felt discomfort, which influenced how they felt, but the more they ran the more they seemed to enjoy it. Many of them became more disciplined in their work and started to put more effort into what they did in practice and in the classroom as well. Some of the students became interested in the biomechanics of running so that they could improve their form and perform better in their races. A lot of them had some of the top scores in the PACER test at their school. One of the most important things that occurred during the year was that they formed a running community within their school. Two memories that come into mind that showed great examples of sportsmanship and compassion were stories based off of the students’ behaviors towards their teammates. We had one student that was having an off day on the track, and I saw a lot of other students hook their arms around that student to help move that student forward. They tried to motivate the student by providing the student with encouraging words so that the student would feel better. It was a great example of not leaving anyone behind. Another time that stood out to me was during one of the long runs. One of our students was finishing up their run but saw that one of his classmates hadn’t finished, so he turned around to run the extra distance with the student who hadn’t completed the run. Being a part of Marathon High also gave me the privilege to see what goes on behind the curtains. Many of the coaches/volunteers/teachers gave students rides to and from practice. By doing that, they gave students an opportunity that they may not have had otherwise. They gave students the opportunity to be a part of something that will make a difference in their lives. That was one of the things that stood out to me the most, because I remember the high school coaches that gave me rides from practice when my parents worked late. Some students didn’t have access to a decent pair of running shoes, and the coaches I worked with did the best they could to find them a pair, so that students wouldn’t get injured in the shoes they already owned. The coaches showed up with positive attitudes and with much needed enthusiasm for sleepy junior high and high school students on Saturday mornings. They provided students with great examples of leadership and were positive examples for the students. To me, they demonstrated an authenticity, they showed kindness without expecting anything in return and that makes all the difference. I hope to be a part of this community again next year, because it was great to work with students and be part of a movement that helps promote a healthy lifestyle. It also did a great job of helping students want to be physically active. I can’t wait to see how many more students decide to participate in Marathon High next year, and I hope to become better acquainted with the other coaches, with Lenora, and other volunteers, because Marathon High forms a running family for students.